During the last month, immigration into Greece fell to only 2,700, whereas Italy received more than three times that number, with a total of 8,370 migrants arriving in the same period. Frontex, the agency for the external border control in the European Union (EU), released the figures on Friday, noting that the shift is due to a series of factors including the agreement between the EU and Turkey and tighter border controls applied by the former Yugoslavian Republic of Macedonia at its border with Greece. “The drop in the number of arrivals on the Greek islands was dramatic. The total for all of April is well below the number of people we often saw reaching just the island of Lesbos on a daily basis during last year’s peak months,” said Frontex Executive Director Fabrice Leggeri. During April Syrians were still the largest group among the migrants arriving in the Greek islands, followed by Pakistani, Afghani and Iraqi nationals. Migrants into Italy, on the other hand, came primarily from Eritrea, Egypt and Nigeria during the same period, which saw no significant numbers of migrants arriving from the Middle East. As Breitbart News reported Friday, this began to change this past week, with hundreds of Syrians, Egyptians and Iraqis arriving on Italian shores. On Friday, the Italian Coast Guard rescued nearly a thousand migrants in the perilous Strait of Sicily and brought them to various ports in southern Italy. When Macedonia secured its borders with Greece and Turkey agreed to take back illegal migrants in March of this year, the so-called Balkan route from Turkey into Europe was effectively shut down. At that time, human smugglers began redesigning their itineraries to traffic migrants into Europe, with many opting for the overland route though Egypt and then across the Mediterranean Sea into Italy. 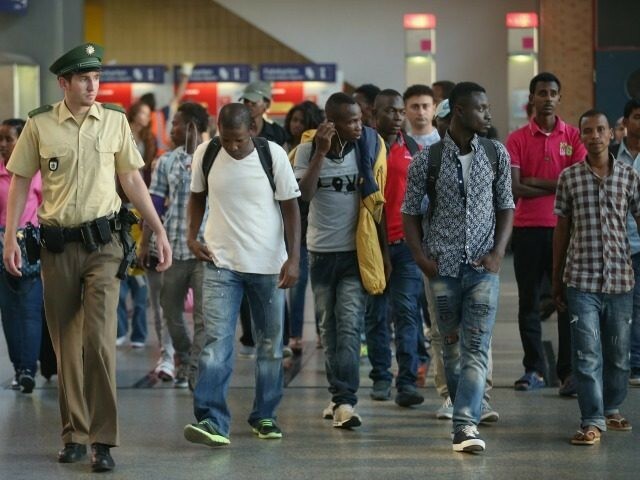 While the vast majority of migrants arriving in Italy during the past year have originated from sub-Saharan Africa, Friday’s boatloads of Middle Eastern migrants signals an important demographic shift for the Italian authorities. The Frontex report notes that the number of migrants reaching Italy has surpassed the totals for Greece for the first time since June 2015.